I'll show you those other Goodwill finds next time,but today I wanted to show you the doll Ken got me for Valentine's Day. Isn't this guy cute? His name is Anthony. He's a Pip Squeaks doll,made by Horsman in 1967. Kind of remind me of the Mamas and the Papas. What do you think? The dolls were Cleo,Mark,Anthony, and Patty. (Makes me think of The Mosquitoes on "Gilligan's Island": Bingo, Bango, Bongo, and Irving.) 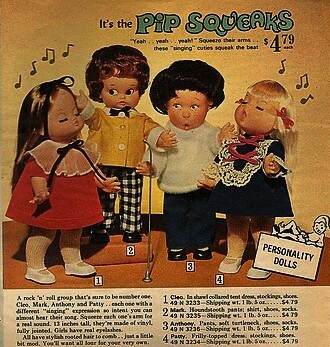 The Pip Squeaks were supposed to be a singing group,and they 'sang' when you squeezed their arms. You can call it singing, but really all they do is,well, squeak. I came across this ad for the Pipsqueaks while researching something else. They really appealed to me,especially Anthony. I tried to find some other pictures or information,but there is almost nothing online. The Pip Squeaks are supposed to be a bit rare,so I thought it would be impossible to find an Anthony. One day recently I was checking Ebay, and there was Anthony in a lot of old dolls. Ken secretly bid on it for me,and on Valentine's Day he produced Anthony. Anthony arrived in a dress and shiny Mary Jane shoes,with a straw hat. So, I had to find some clothes that would fit him. This shirt doesn't close in the back,and his stretchy pants have a hole in them. He also needs shoes. But for now he's at least not naked! I made him the scarf and toboggan ,(Which I guess is called a 'beanie' these days. ), out of an old sock. It was cold out, so he needed them. He does have some stains on his face that I couldn't get off.but he still has a lot of personality. He was amazed that my daffodils are coming up already. Sure, you make me a hat and scarf, but you send me out without shoes! And from under all last year's brown sweet pea vines, there are some new green vines peeking through. He's only 13" tall. It says that right in the ad, but I imagined him being taller. So there he is.Next time,Goodwill dolls! He's a cute, funny little fellow, and what a nice surprise from your hubby for Valentine's Day!